The Historic Centre of Lima has been a leading city in the New World from its foundation in 1535 by Spanish conquistador Francisco Pizarro. The centre covers both banks of the river Rimac (after which the city was named). It holds numerous religious and public buildings that date from the 17th and 18th centuries. Its first university, Saint Mark University, was established here in 1551 and its first printing press in 1584. It also became an important religious center, a Roman Catholic diocese was established in 1541 and converted to an archdiocese five years later. The earthquake of 1656 destroyed most of the original constructions. Lima was my first impression of Peru, and I was pleasantly surprised by it. The city nowadays has a quite prosperous feel to it, and a fancy new bus system that works like a metro (El Metropolitano) makes travelling around safe and easy. Even the fog that famously covers Lima for most of the year was replaced by a bright blue sky when I visited. The Plaza de Armas is probably the most “central” place of the historic centre. It’s a major crossroads too, so it’s not totally relaxed for pedestrians. The square is covered on all sides by historic buildings. 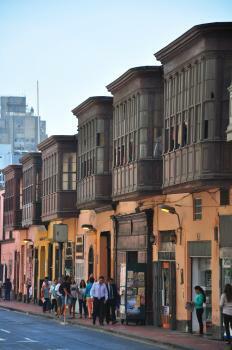 It is here that I first noticed the elaborate wooden balconies which are a common on Lima’s old colonial structures. The archbishop’s palace has one of the best of all. Next door is the Cathedral. It does look pretty standard Latin American Baroque from the outside, but inside there are several gems. The first chapel holds the bones of Pizarro, and some beautiful clear mosaics. The Chapel of Our Lady of the Evangelization (renamed so by Pope John Paul II, we should try to make a Connection out of him as he has left his mark all over the globe!) is a masterpiece in turquoise and gold colouring. Other chapels have finely sculptured wooden altars, and the main altar is not to be missed either. The best sight in the centre still is the Convent of San Francisco. 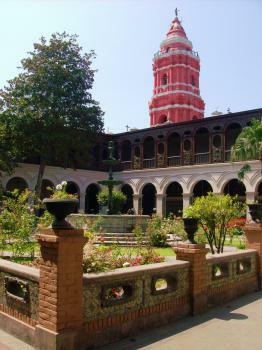 Before the WHS got extended to include the whole of Lima's city centre, the nomination solely consisted of this convent. It is probably the most emblematic of Lima's history. You are not allowed to take any pictures inside, and that may attribute to the fact that it is not a very well known site in general. But marvellous it surely is. And busy too - lots of school children, eager to see the underground ossuary I guess. Guides lead you through the large monastery complex. The damage of the various earthquakes that have struck Lima is still clearly visible here, some of the interior walls are leaning over. I especially liked the wooden ceilings here, one of which is in a grandiose Moorish style. I was really surprised that many people did not like Lima, since I really enjoyed this city and maybe one of the most surprising place I have seen during my one-month trip in South America. Maybe because of this year El Nino, Lima I have seen was very bright with clear sky, so bright that even locals admitted that this kind of sunshine is rarely happened. One of the most outstanding features of Lima’s historic center is the vibrant of architectural styles from pure colonial Spanish baroque, lovely art nouveau, and even neo-classical that almost make Lima to be little Madrid. As a World Heritage Site enthusiast, Basilica de San Francisco was the first place I went to see as this basilica is the original reason why Lima has been put on the list. The grand Basilica is located in the center of the old district. The highlights of the Basilica are the catacomb and the ceilings of the Basilica complex. The catacomb is very interesting however I am not a fan of dark tourism, so I was happy to just a brief look. But the ceilings of church and monastery are really beautiful from indigenous design to Moorish inspired dome. Really a nice place but I am not sure that from present ICOMOS standard, the site can be inscribed by their own merit and I was far more appreciate from the rest of the old city. After Basilica, I went to see the city cathedral, maybe I had expected too much for the main church of Spanish capital of South America, the interior is quite disappointing and too much plain compared to churches in Quito, maybe the most lavish part is the tomb of Pizarro. 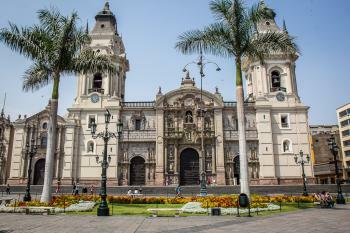 The next must see of Lima is its central square, Plaza de Armas. The square is very lovely with nice buildings painted in yellow. The presidential palace is quite impressive. However, in my opinion the beauty of wooden box balcony on many buildings are the real gem to see. Each has its own uniqueness for its design and craftsmanship. One in front of the former governor palace is exceptionally eye catching. The simple but very long one the building corner next the cathedral is also very unique. After saw many fine churches, then I walked along many streets, and surprising discovered many nice art nouveau buildings and more buildings with those lovely wooden box balconies, and for me these style of architecture become a symbol of Lima. Neo-classical buildings around Plaza San Martin is another big surprise for me, it really contrasts with yellow Plaza de Armas, as every building around the plaza are in white and in Spanish neo classical styles that remind me Palacio de Cibeles and many imposing building along the famous Calle de Alcala in Madrid. The walking street of Jiron de la Union is very lively with many shops and locals are in full with spirit of shopping. While Lima was not chaotic liked I saw in Quito, because the city is far more expanded and modern, the city was still crowded with people and the traffic was really congested but again because of El Nino, I did not find the city to be polluted much as I expected, and after saw Miraflores area, while my local friend warned me a lot for safety issue, I found that Lima is such a great city with good food, nice landscape and load of culture to explore from Inca to colonial and vibrant contemporary art. Visiting Lima is a must for Peru, not because it is World Heritage Site, but because this city offer some of the finest urban lifestyle and food I saw and ate in the America. I was surprised to bump into quite a few tourists in Lima who couldn't be bothered to go to the historic part of the city - they thought it would be boring and/or unsafe and preferred to stay around the beaches and the touristy areas. I think they missed out! There are some really beautiful buildings here and you can easily spend a day checking them out and having a relaxed meal or drink in one of the squares. My two highlights - and must sees for everyone - are the Monastery of San Francisco and the main cathedral. They are absolutely stunning inside. Don't miss the tomb for Pizarro in the cathedral. There are alot of mixed feelings about Lima. I take it for what its worth. I had a great time here. We stayed in the Historic Centre of Lima in a hostel, not too bad at all. Though its not reccomended to do too much wandering in some areas late at night, its generally safe. We decided to go half budget and half all-out. We also stayed at a more pricey hotel near the Ocean. During my ten day trip to Peru, we spent 2-3 days in Lima, most of our time was spent in and around Cuzco and Puno. As far as Colonial cities go this is not the best, nor worst I've seen. As someone that is deeply interested in history, I found the historic center to be fascinating and definetly worth a visit. That being said Lima really is the gateway to Peru, and though it should not be ignored as it does offer some worthy sites, it does not compare to some of the other amazing places the country has to offer. Lima also offers a couple interesting day trips from the city. Pachacamac is only about an hour south of the city. Lima more than any other Peruvian city shows the struggling modernity of Peru. There are some highrise buildings, business centers and fun entertainment areas in the Flores district. Yet, as soon as you get to the outskirts of Lima there are countless shanty towns. Lima at least in my opinion represents modern Peru more than any other city in the country, as Cuzco is far more about the past than the future. Looking a bit more in depth, you might just find Lima more interesting than you expected. Whilst there are some interesting things to see in Lima, it is very difficult to believe that the city deserves its WHS status. The Monastary of San Francisco is very interesting, but much else stands out. 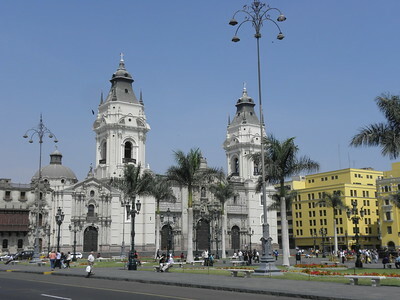 There are plenty of old colonial cities on the WHS list, and there are plenty that are not that are much nicer than Lima. However, for WHS list tickers it is an easy site to 'bag' as it is the gateway for the rest of Peru, and the other sites in this wonderful country are magnificent! My memories of Lima are rather vague - having just had a nightmare journey from the UK. Yes it is a grubby, run down and in someplaces poverty wracked city. But what I do remember was a fairly pleasant afternoon viewing the central colonial squares, which whilst nice are put in the shade by Arequippa. The Gold Museum was interesting not so much for the gold, but for the exquisite pre-columbian fabrics upstairs. But for me the highpoint was the 'Lord of Sipan' at the National Museum, whose treasures were every bit as good as King Tuttankahmun's. Although I am told thes have now been moved to a purpose built museum where they were excavated. Verdict - look beyond the grubbiness of the city itself and there are some real gems to be seen. Is there no one out there prepared to write a (positive?) review of the “Historic Centre of Lima”? Lima has a poor reputation among tourists – I have not even been able to find a “good” photo of my own (from visits in 1973 and 84!) and thus present a rather mediocre one of the Plaza de Armas on a typical grey Lima day – looking very dull in the “garua” mist which covers the city for much of the year. But, if you visit Peru (Which is a wonderful destination - it is perhaps my favourite country for its “variety” of sights - historic, ethnic, scenic (mountains, desert, and jungle) and wildlife) you will have to come to terms with Lima as the port of entry, the transport hub and home for a third of Peru’s population. Does it justify its WHS status? Well there are colonial remnants if you look for them. Its cathedral in the Plaza de Armas contains the (possible?) remains of Pizarro, there are also a few mansions/houses and a fine monastery but Cuzco and Arequipa maintain more of a colonial atmosphere. I feel it must have been inscribed as much because of its place in colonial history as because of what remains now. There are some good museums which will complement what you have already or are about to see up-country. I operate a rule of thumb scale of 0-3 days for assessing how long to give a city within a speedy touring itinerary (as a non “city lover” I do not award many the 3 days!). Lima certainly justifies its 1 and you would need another half day if you want to take in more than 2 museums. It has a name for theft etc and it is the only city in the world where we have actually been recipients of the “gunge on the rucksack” trick – a “well meaning” passer-by points out some nasty mess which has somehow got onto your rucksack (placed there earlier by an accomplice) and offers to help you clean it off – if you take your rucksack off you will suddenly be surrounded by numerous others and your rucksack will disappear! We did not of course and it was quite nice to have the existence of this scam proven to us! It should be mentioned in fairness that this was an isolated incident and that the general atmosphere has been friendly on the 2 occasions we have visited the city. So, it is difficult to make a strong case for “Unlovely Lima” other than it is less bad than it is often painted! It is perhaps worth “trying to love” however! Equestrian Statues: Pizarro, Lima City Walls Park behind the Convent of San Francisco. Was located in Plaza des Armas until 2002 but was moved in response to indigenous opposition. Also not really of Pizarro! See Link. Bolivar - Legislative Palace (1859). Erected when the Plaza del a Inquisicion was renamed - replica of statue in Caracas. The Inquisition: The Inquisition operated from a1570-1820 in a building which later became the Senate and now houses the Museum of the Inquisition (Junin 548 -3 blocks from Cathedral). 274 Community Members have visited.